For nearly three decades, China has been the world's biggest importer of waste. Each year, Chinese manufacturers and recyclers import 8 million tons of foreign waste to China to be reused as raw materials for new products. While the waste produces health and environmental problems, these issues have long been overshadowed by the economic interests of both China and the exporting nations, which are mostly in the West. While recycling raw materials has helped Chinese firms save money, it has also helped Western countries earn money and solve their garbage problem. So when China recently told the WTO that it will ban 24 types of solid waste imports before the year's end in order to protect its citizens' health and safety, the global recycling industry was left wondering: If China will no longer accept the globe's garbage, where will it all go? The West's plastic recycling is dependent on China. A total of 87 percent of Europe's waste plastic, for example, ends up in China. Globally, 56 percent of waste plastic is exported to China, according to a report by the International Solid Waste Association. Even developing countries, such as Vietnam, Indonesia and Malaysia, re-export reprocessed imports and domestically collected plastic scrap to China, the reports says. Dependence on a single importer can be risky, and that risk is now looming as China plans to shut its doors to foreign waste. The 24 types of waste that are banned this time include plastic waste from living sources, toxic vanadium slag, unsorted waste paper and waste textile materials which are environmentally hazardous. "Most of them used to be on the 'restricted' list of China's import regulations, and this time they are banned," said Liu Jianguo, a professor specializing in solid waste management at Tsinghua University. Apart from environmentally hazardous solid waste, China will also ban imports of solid waste that can be replaced by domestic resources by the end of 2019, according to the State Council. For the recycling industry overseas, it's a nightmare scenario. Robin Wiener, president of the Institute of Scrap Recycling Industries, a Washington-based trade association, said in a statement that China's ban will be "catastrophic" to the US recycling industry, which transforms obsolete materials into secondary raw materials before they are exported to China. "With more than $5.6 billion in scrap commodities exported from the United States to China last year alone, the trade in specification-grade commodities - metals, paper and plastics - between the United States and China is of critical importance to the health and success of the United States based recycling industry. If implemented, a ban on scrap imports will result in the loss of tens of thousands of jobs and closure of many recycling businesses throughout the United States," he said. Arnaud Brunet, director general of the Bureau of International Recycling (BIR), a Belgium-based NGO, expressed a similar concern, saying the impact of the ban will be "devastating." In a letter to the WTO, BIR called for China to reconsider its decision. 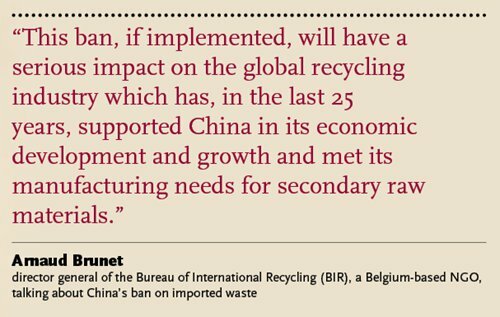 "This ban, if implemented, will have a serious impact on the global recycling industry which has, in the last 25 years, supported China in its economic development and growth and met its manufacturing needs for secondary raw materials," Brunet said in a statement. The flow of international scrap to China amount to tens of billions US dollars' worth of goods, he said. Chinese experts, however, say such a ban is inevitable as China's industries upgrade and environmental protection is made a priority. "Western countries will have to think of ways to digest their waste themselves, including through landfill or incineration," Liu told the Global Times. Liu said while part of the industry might move to countries in Southeast Asia, India and Pakistan following China's ban, the relatively small capacity of these countries won't be able to satisfy global demand. Others think this is an opportunity, rather than disaster, for Western countries. Steve Wong, executive president of the China Scrap Plastic Association, said China's ban might be an "opportunity for recycling" in the US, according to industry website Resource Recycling. Wong, also the chairman of a Hong Kong recycling company, said at a recent conference that he is planning to open a plant in the US. China started to import solid waste in the 1980s, when its rapidly growing economy fueled gigantic demand for cheap raw materials. "Solid waste is a resource and source of pollution at the same time. In the past, when China needed to develop the economy, it valued its economic value and ignored how it may also pollute the environment," Wang Wang, secretary general of the China Scrap Plastic Association, told the Global Times. "A lot of people thought the majority of foreign waste was smuggled into China. But actually, most of it enters China legally and only a small amount is smuggled," Xu Haiyun, chief engineer of the China Urban Construction Design and Research Institute, told the Global Times. But as China deepens its supply-side reforms, more attention is being paid to protecting the environment. This is not the first time China has restricted waste imports. In 2013, China launched the "Green Fence" campaign, a 10-month long initiative to prevent the import of unsorted shipments of recyclable waste from abroad. During the campaign, China prevented about 58,800 tons of foreign waste from entering the country, the Xinhua News Agency reported. While the latest move has dealt a blow to overseas waste exporters, it will also push China's domestic recycling industry to upgrade its technology and standards. 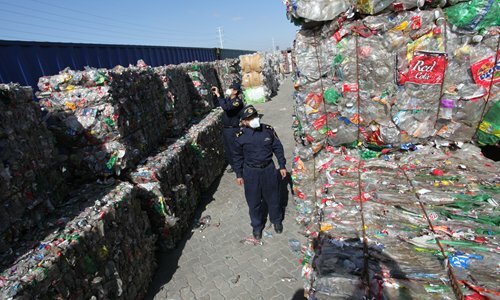 China launched a campaign to inspect all factories that hold import licenses for plastic waste recycling this July, when 420 officers from the Ministry of Environmental Protection conducted a special round of inspections in 22 regions involving 1,792 factories that deal with imported waste, checking their pollution controls and import permits. By July 29, the ministry had given suggestions or punishments to 1,074, or 60 percent, of these businesses. The head of a chemical fiber factory in Jiaxing, East China's Zhejiang Province told the Beijing Youth Daily that previously around 50 percent of the raw materials the factory used were scrap plastic from countries including Indonesia, Bangladesh and Tanzania. The factory has now stopped importing scrap plastic and vows to use only primary domestic raw materials in the future. "It takes months to import these materials and sometimes when they enter China, the price of domestic materials has dropped. This won't be a problem in the future," the factory head told Beijing Youth Daily. But as the ban looms, this question is being posed - how to fill China's demand gap, when as much as a quarter of the raw materials in some industries come from foreign recyclable waste. Experts say one way to bridge this gap is for China to recycle more of its own waste, much of which now ends up in landfills. "It's especially important to raise China's safe recycling rate. China recycles a lot of things, but most of it is done by small family businesses which pay no attention to pollution," Wang said. One reason that Chinese businesses favor imported waste is that it is of better quality. A businessman in Shanghai who declined to be named told the Global Times that some imported plastic waste is both cheaper and of better quality than domestic waste. The majority of Chinese recyclers which provide raw materials to manufacturers are small family-run affairs which use low-tech equipment and often ignore environmental protection rules. The other way is to use more primary raw materials to replace foreign recycled waste, which may push up prices. "I used to visit a fabric factory in Guangdong Province which manufactured fabric using imported second-hand clothes. The factory won many awards for its recycling efforts and even receives government subsidies. But it doesn't dare tell the public what its fabrics are made of. Why doesn't it use cotton from Xinjiang as its raw material?" Xu said.